Destructiveness has been condemned by our society in India, It is not acceptable at all. Destructive mindset is unwelcome and is usually discriminated and considered anti-social. 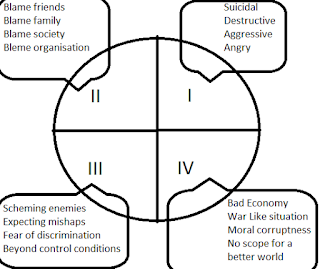 A person in destructive mode is in quadrant I. He is suicidal. He may cause destruction. He may show unwarranted aggressive behavior. He may express anger to even favorable situations. Such a person behaves with close associates as in quadrant II. He blames his friends, family, society and organisation for his failures. Any one of them or some of them or all of them. 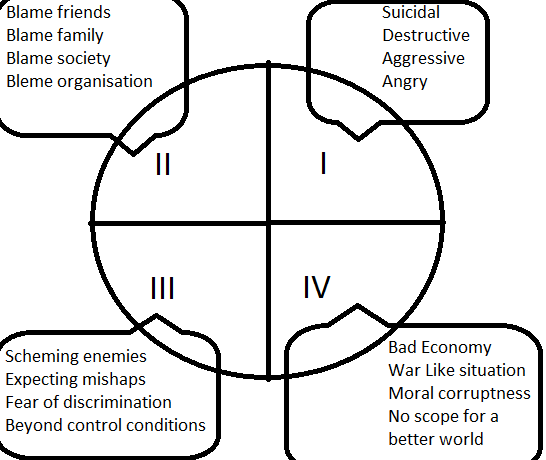 A person with destructive mindset anticipates as in quadrant III. He begins to expect scheming enemies and foresees situations beyond control. He anticipates mishaps and fears of further discrimination arise in his mind. Such a person views the world differently and is as in quadrant IV. He feels the situation is unwelcome and there is no scope for improvement. He sees moral corruption everywhere. Is it bad to have a destructive mindset? There are work which calls for channelizing this mindset for welfare. Cleaning, polishing, exercising, physical work are some ways to channelize this mindset. Lord Shiva was a god of destruction. There are many devotees of Shiva. Much more than Vishnu devotees. But people in haste and greed forget to listen to reason and follow the successful for short term gains.